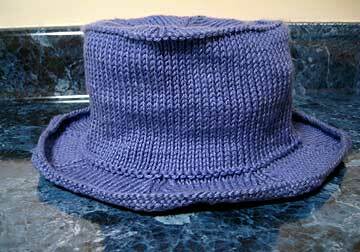 I ended up knitting two of these cute bucket hats from Little Turtle Knits. The pattern was simple and easy to follow, but is written for cotton yarn that shrinks. After knitting an admittedly tiny swatch and running it through the washer/dryer, my measurements showed the yarn I had chosen (Knitpicks Shine) did not shrink, so I cast on and I followed the instructions for the next size down. As I was nearing the top of the hat, it seemed to be a bit...lofty. As in Abraham Lincoln stovepipe hat lofty. I stopped for a moment and thought to myself, "Well, now that don't look right. That don't look right t'all." But, I forged on and against my better instincts, continued to follow the pattern as written. I should have followed my gut. Our 16th president would have been proud. After throwing it in the washer and dryer on the hottest settings in a desperate attempt to save this wip, I discovered that Shine does indeed shrink in length (not width), this one by about 1/2". That, unfortunately, was not quite enough. Adding insult to injury, the hat was not only too tall, but also a bit too snug around the head. Suffice to say I bore a striking resemblance to Marge Simpson. Luckily, I had purchased enough yarn to knit another (in keeping with my gripping paranoia of finding myself short a skein mid-project), so I shook it off and gave it another go. This time, I followed the width for the largest size, but the height for the smallest + about a 1/4" to allow for shrinkage. The gut knows its stuff, because bucket hat #2 came out perfect! While the sizing is spot on and I do forsee donning this hat on many a summer day, this yarn is just a bit too drapey for this hat. The brim, even the shorter one on hat #1, doesn't stay up the way it should and droops over my eyes. Shine also has a tendency to be a bit splitty and after just one run through the washer/dryer, both hats fuzzed up quite noticeably. Not the soft peach fuzz that imparts a lovely blurred bloominess, more like a been around the block, time to get out the fabric shaver pile. That being said, Shine is unbelievably soft, has a beautiful sheen, and is just a pleasure to knit with. Plus, it's so reasonably priced that I got away with both of these hats for just over $17. I would definitely consider this yarn for future projects, but use the delicate cycle when running it through the w/d. On another note, this was my first project using dpns. I was afraid they would flop around, poke me in the eye, fly out of my stitches and across the room, or just be utterly confusing and disorienting. To my surprise, I found I really like using dpns! It's much easier for me to keep track of where I am in the round, maintain my tension, and having the other two needles waving around while I'm knitting doesn't really bother me. Having tried both magic loop on the Noni bag and the double circ method on practice yarn, I much prefer dpns. And Bryspuns are great! Smooth but not slippery, so there isn't any drag while you're knitting but the non-working stitches stay put. Is my Lorna's Laces here yet? Lessons learned: Don't be afraid to follow your instincts and for God's sake woman, don't be stingy when you swatch!